This drop caught me a bit by surprise! Were it not for the enterprising @offdutytrip, I might not have gotten to this drop in stores before my sizes sold out! Luckily, A. Cheng still had most items in a workable size for me. Note: A. Cheng doesn't seem to post their stock online immediately, so you should call if you wish to order. I have so many thoughts that I decided to split this into two posts for the sake of timeliness. See below for reviews and photos of the first half! First off, a try-on of the Ace & Jig Slipper Dress in Major, which I seem to have missed from before. 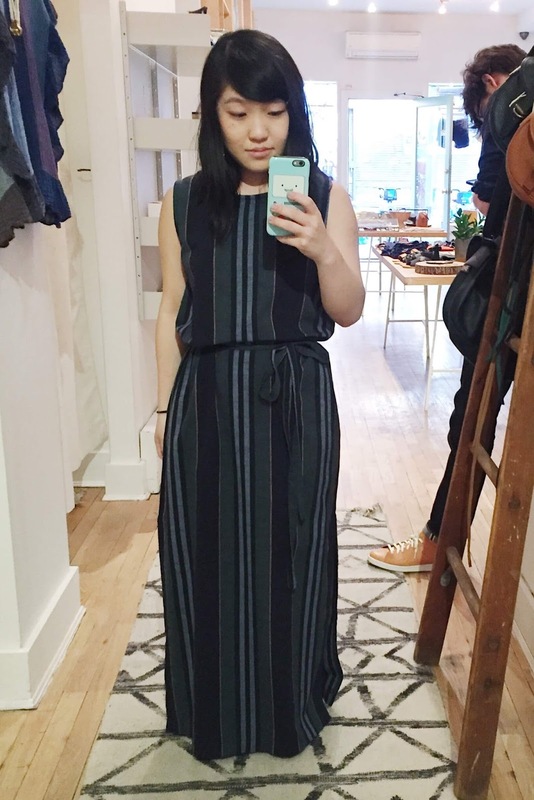 This is an XS, fits TTS, and works far better than the one I tried on in Solstice at Barneys due to a less stiff fabric. 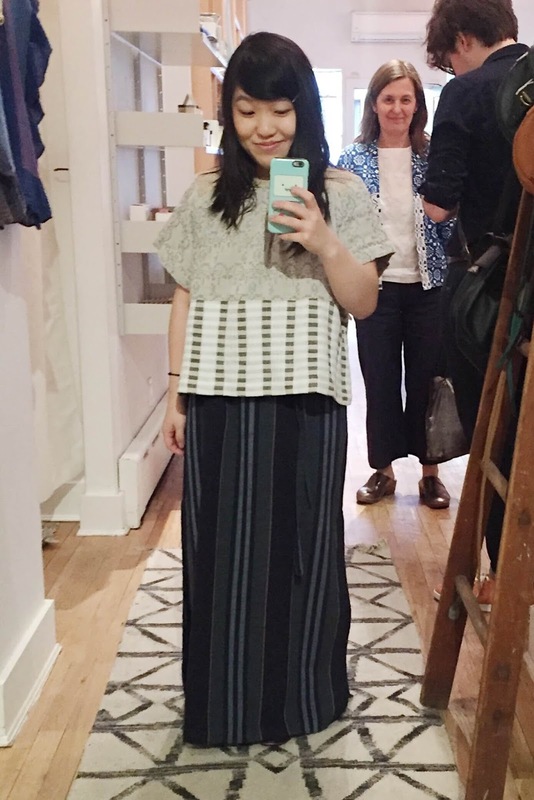 Flattering silhouette, crisp, sturdy fabric, and elongating vertical stripes. A bit too long for me, but easy to fake it by belting. I could see wearing this to an evening function, but it's definitely too fabulous for my decidedly unfabulous daily life. I chose to layer the Ace & Jig Vista Top in Filigree/Chester on top of the slipper dress due to a lack of bottoms. This is an XS and fit TTS. I think the sleeves on the Vista top work better in a doublegauze like Filigree, as they stuck out a bit too much for me when I tried it on in the Barneys Exclusive Merry version. While it worked okay silhouette-wise, I have to admit... I find this top just extremely unattractive. Oh, it's a nice shape, and Filigree is soft and drapey, but I don't understand this textile combo at all. It seems so random! I would accept an all-Chester or all-Filigree version of this top, but the combination of the two in this way just does not work. 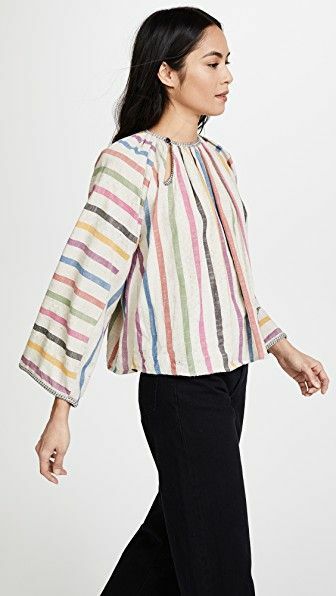 Last but certainly not least, we have the Ace & Jig Booker Blouse in Twine! This was one I had earmarked early on as a must-have for myself, and it doesn't disappoint IRL either! Sadly, the smallest available size was Medium, which is what I have on above. But it's workable even so in a nice oversized way! A lower-necked version of the FW '16 Mercer Top, this blouse is extremely versatile and flattering and reminds me of the SS '14 Blouse that came in Diamond, sans awkward puff-sleeves, and the iconic Jardin Top. I've already preordered mine (haven't received yet), but now I'm confident that, barring any sizing or production issues, it's a keeper once it finally gets to me! Twine itself is a lovely and flattering mauve color, with dots in two shades of pink and black details. A doublegauze that has no metallic and doesn't seem too prone to pulls, I predict that Twine will be a future classic Ace & Jig textile. What do you think about the pieces above? Be sure to come back for Part 2, featuring the Hot Cross Dress in Carnival! EDIT: Part 2 now available! Everything looks great on you! I totally agree about the Filigree/Chester Vista top, though. 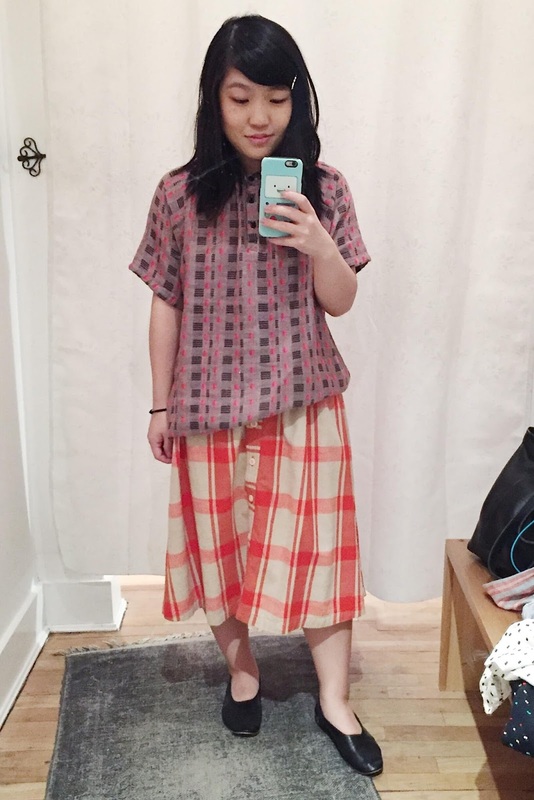 I like both of those textiles individually but not together! It's a shame because either would make an amazing Vista top on it's own. Thanks for sharing! You're too kind, thank you! And I agree about the Vista Top! I think Barneys had the right idea when they decided to make an all-Merry Vista XO. So much better than the textile blocking, IMO! Good question. It appears as though Twine is 100% cotton, and while the threads are bright pink, they're not neon in quite the same way as some of the threads on spree (which were problematic because they were slippery polyester). Seems like it should be safe. I'm going to be receiving a couple of twine pieces for my personal collection soon, and can try and speak to sturdiness after a few wears!